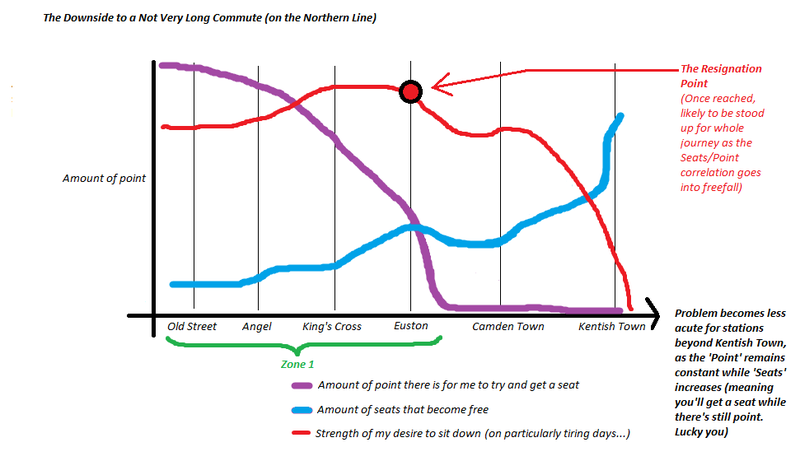 This occurred to me as I squeezed myself between door and other commuters on my way home last night (see fabulously scientific and precise graph, absolutely in no way cobbled together in MS Paint. Obviously). In any case, when I move to a totally different part of London in the next few months, my situation will change dramatically. For the purposes of this blogpost, all you need to know is that I’ll go back to living ‘at the end of a line’ (having already done so for 2 years before moving to where I am currently), and, while being virtually guaranteed a seat in such situations due to my travelling SO FAR AWAY, the fact that it takes so long may mean it’s only marginally worth it – however, as the graphs shows, there are downsides to being closer, too. Sigh. I should also point out here that the desire to get a seat is not merely a primeval urge on my part to hoof fellow commuters out the way and sink into the not-so-comfortable space with a short-lived sense of smug satisfaction at being the Seat Queen – it’s also because you can only really ‘do stuff’ on the Tube when you’re in a seat, be it have a nice little snooze, get in to a good book, make notes, have a proper think, etc. Londoners may be experts at using the Tube, and yes, while I can do all those aforementioned things while standing, often without even needing to hold on to a pole (‘Advanced Tube Surfing’, if you will), the sweet glow of dropping into a perfectly vacated, fairly-and-squarely-and-politely obtained seat when you still have enough stops left to go to make it worthwhile is near priceless at the end of a long day when you live at the end of the line (or a few stops prior). And then, there’s NOT living at the end of the line. Closer, yes, but, as the graph shows, the ‘free seats’ to ‘point of trying to get it’ law makes this less viable than you might otherwise believe. Basically, you get really, really good at standing up – which is mitigated only slightly if, by some wonderful chance, you’ve bagged the neat little space next to the door on the side you need to get off from, in which you can nestle and even book-read without obviously being in anyone’s way, and casually slip out of on to your home platform without so much as brushing past another passenger. And, because you can lean on to the partition glass inside, you don’t even need to hold on to a pole, or make awkward non-eye-contact with your fellow travellers. Genius. But, well, as the graph above demonstrates, for my current commute, it’s hardly worth it. Bascially, my friends, it all ends with Euston. Impossibly colourful, breathtakingly vibrant, relentlessly entertaining and hilariously cheesy, my evening in the company of the Merchants of Bollywood was the best fun I’ve had at the theatre for a very, very long time. Imagine sequins, colour, light shows, ridiculous overacting, satire and simply fantastic, infectiously energetic Bollywood dancing and musical rhythms, and you’ll only have captured half of the riotous evening that was had by all present. There was, truly, dancing in the aisles, and although my friend and I (just) stayed in our (highly-discounted, £10, yes!) seats, I absolutely loved it. 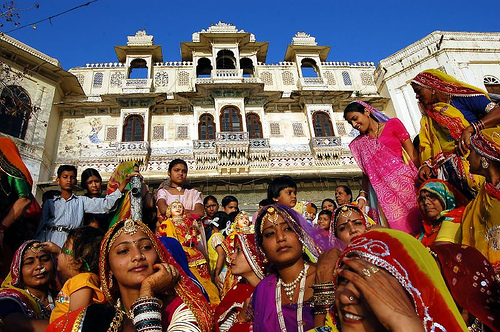 For reasons unknown, since I’ve never been to India and, as far as I’m aware, have no personal connections with the country, its culture, colours, languages, architecture and traditions fascinate me. Ever since I can remember, I’ve been in love with the fabulous array of fabrics, jewellery, pottery, flavours, spirituality, landscape, architecture and near-overwhelming bustle of humanity that emanate from all photographs and accounts of the region like the pulse from a raging, dancing heart. The more I find out about it, the more images, travel guides, travelogues, memoirs and magazine editorials that I see and read about the place, even the heart-wrenching accounts of the devastatingly unassailable levels of poverty, sexism, racism and innumerable other corruptions and injustices that sweep the subcontinent, only serve to make my yearning to travel and explore the faintly terrifying but completely irresistible maelstrom of the world’s largest democracy ‒ home to over 1 billion people, more complex, more confusing, more contradictory and more intoxicatingly fabulous than I can even fathom ‒ stronger.